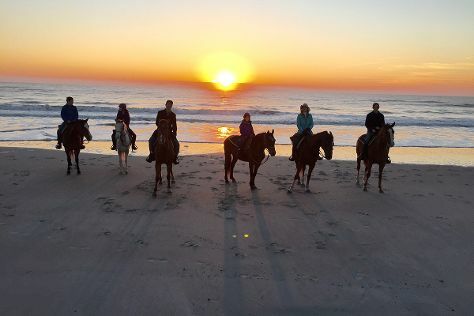 Start off your visit on the 26th (Fri): trot along with Amelia Island Horseback Riding. To find ratings, more things to do, maps, and tourist information, read our Amelia Island trip planner. Jacksonville to Amelia Island is an approximately 1-hour car ride. You can also do a combination of bus and taxi. April in Amelia Island sees daily highs of 78°F and lows of 63°F at night. Wrap up your sightseeing by early afternoon on the 26th (Fri) to allow enough time to drive to Orlando. On the 27th (Sat), make an unforgettable trip to Walt Disney World Resort. Make your Orlando itinerary with Inspirock to find out what to see and where to go. Getting from Amelia Island to Orlando by car takes about 3 hours. Other options: take a bus; or take a train. When traveling from Amelia Island in April, plan for a bit warmer days and about the same nights in Orlando: temperatures range from 84°F by day to 65°F at night. Finish your sightseeing early on the 27th (Sat) so you can drive back home.